Our video of Spook Cave float has been up on YouTube for a few weeks, so I thought it was about time I posted it here. I filmed it with my Pentax camera and threw some haunting music behind it. We start with the water wheel that turns from the stream that comes from the cave. The mill used to power the cave’s lights, but it’s now on the modern grid. Listen carefully for the guide pointing out the cave’s features as well as two sleeping bats. 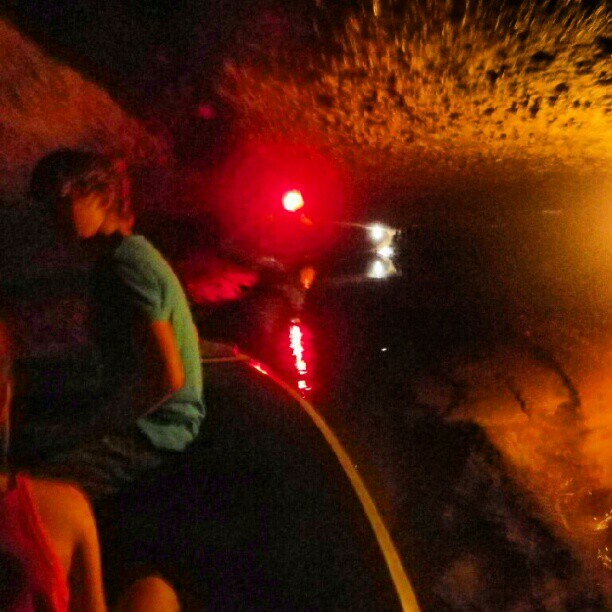 Floating through Spook Cave in a boat. There is something River Styx-like in a tour of Spook Cave in McGregor, Iowa. After coughing up a few drachma (drachmas? drachmi? ), you step into a small boat guided by Charon. Well, his name wasn’t actually Charon. He was young man, not an undead ferryman carting newly dead souls to the Greek underworld. But his name did begin with a “Ch.” Instead of a pole or oar, the guide had an electric trolling motor lashed to the bow that pulled us to the cave’s mouth. Spook Cave was blasted in to existence in 1953 when Gerald Mielke dynamited his way into that had been a small hole — known for years for its spooky noises — in the base of the limestone cliffs abutting Bloody Run Creek. He rigged lights to a water mill that turned by the flow coming out of the cliff and opened what is now one of the two show caves in Iowa. Although carved up in places, Spook Cave still has some tight squeezes. More than twice, the roof came within a foot of the boat’s gunwales, causing passengers to duck forward to keep from scraping their heads as Charon maneuvered the craft using a series of handles in the ceiling. I opted to lean back into the row behind me. It took abdominal strength to hold the plank, but there was water and there was darkness. I wanted to be able to see what was going on. The tour floats between manmade and natural passages, showing off a few stalactites, flowstone, popcorn and the lower end of a sinkhole. And unlike the River Styx, passengers return to the surface world, where there is a gift shop. Check back later for our video. The rubber raft swayed with a wobbly ripple as it took on new passengers. Its cardboard box guaranteed it would hold four people — four men, to be exact — and we planned to hold the manufacturer to the promise on its maiden voyage. No test run. Just pile everybody in. My 9-year-old son took the bow, followed by my wife and 5-year-old daughter. I sat in the stern, and it wasn’t too long before my daughter decided to relocate to my lap. With the raft’s gunwale significantly above the waterline, we set out. I remembered piloting a similar craft alone on a Minnesota lake while vacationing with my parents in my teen years. I recalled maneuvering around with some directness — heading out, turning around, spinning clockwise and widdershins all with a few strokes of the oars. But now, with four people aboard, movement took more effort. We must have been quite a sight for those fishing from the nearby jetty as the raft floundered around and drifted from the launch pier toward the shore. The kayaking family who put in after us was long gone by now. Our paddles weren’t very helpful. They were three-piece, screw together contraptions — a blade and two shaft sections, all plastic. First, the shafts kept unscrewing as we rowed, then they started bending at the joints. Circling haplessly near land, we decided to remove one section from each paddle, leaving just the blade and a stubby shaft. Although this gave us less leverage, the short shaft made it easier to row with the preschooler in my lap. The spare sections made adequate pushing sticks. 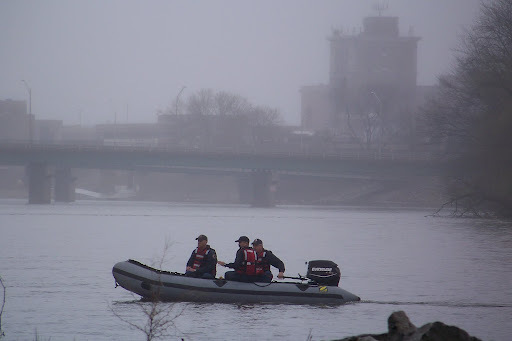 Firefighters training with boats on the Cedar River . Last week I had the opportunity to photograph and write about local firefighters while they practiced piloting different search and rescue boats. The exercises were the annual spring refresher courses ahead of the annual boating season and flooding. The weather was cold and foggy with occasional showers. Even so, it was better to sit on a cold aluminum boat in the rain than to be at the office.